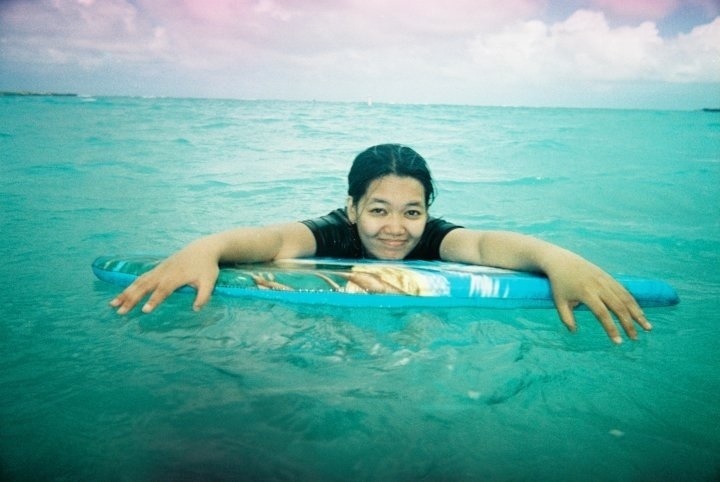 Since it’s summer, I am taking myself to a mental vacation to Hawaii by cooking something I miss from the island. 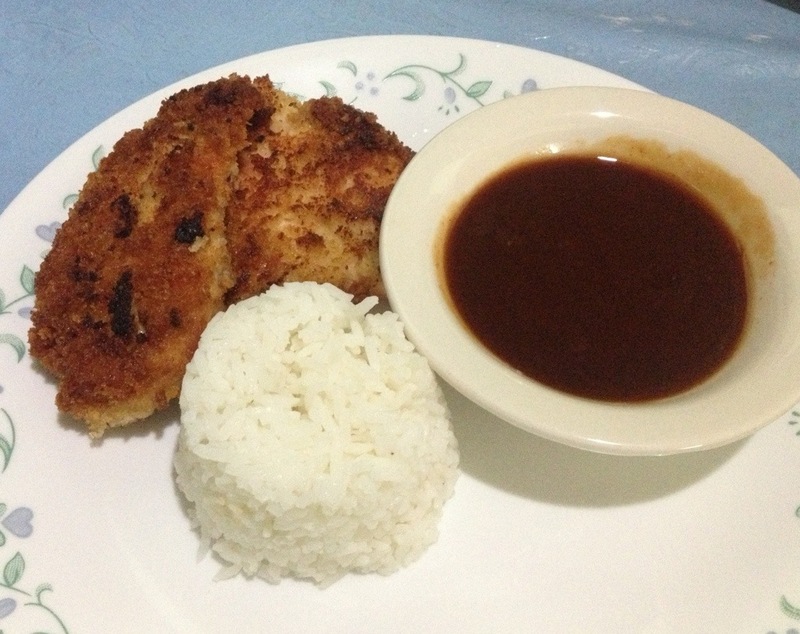 And that is the Chicken Katsu! 🙂 Although Katsu is Japanese by origin, it is also considered one of Hawaii’s staple food (aside from Spam hihi). There is also a known food chain there that serves one of the best katsu in town: L&L Hawaiian Barbecue whose katsu I’m gonna try to copy today. whew! The sauce can make or break the dish. As far as I know, L&L has the best katsu sauce I’ve tried. What I did is I made the sauce first, then chilled it before prepping the chicken. Just mix all together except corstarch then bring to a boil. After that, mix in cornstanch then boil again stirring occasionally. Once sauce thickens, place it in a bowl then chill. Whisk ingredients together then dip chicken in it, then into bread crumbs. Fry until golden brown. Serve with chilled sauce. Decided to cook again today to maximize my 3-day off. 🙂 My choice of meat is, again, chicken breasts. And guess what I made today? 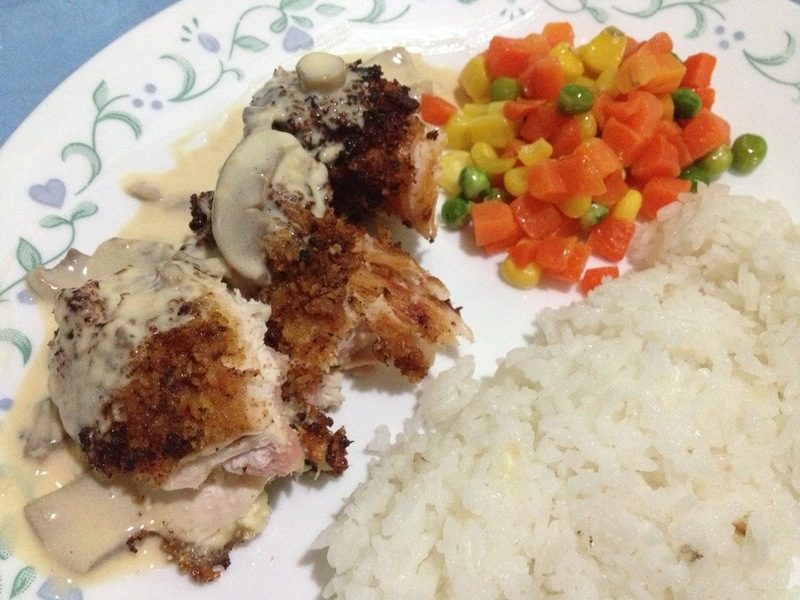 Yes, Chicken Cordon Bleu with creamy mushroom sauce. As opposed to what others think that it is tedious to make cordon bleu, it’s actually not as hard as it seems. And no, you don’t always need to bake them. Lay chicken breasts flat on a clean surface. Put ham and cheese on top then roll chicken and secure with a toothpick if needed. In a bowl, beat an egg then add salt and pepper. Place bread crumbs on a separate bowl as well. In a pan, heat some oil for frying. When ready, dip rolls into the egg mixture then into the breadcrumbs. Fry till golden or till chicken is cooked all the way through. For the sauce, toss mushroom in olive oil. Let it simmer for 2 minutes then season with salt, garlic powder and some butter. Then slowly add all purpose cream and evaporated milk. Let it simmer for 5 minutes while stirring constantly. When CaliBurger opened in the Philippines few months ago, foodies went crazy creating a hype that got me curious. Add to that, every good looking photo of their burgers and fries that I see on Instagram on a daily basis. But aside from that, I have also heard not so good reviews about this burger joint. Since I got to try it today, I now know that it’s just all hype. I have thought of my food carefully. I didn’t want the Double Burger because I wanted to equally enjoy the fries. So, I ordered Combo B (P325): that’s a cheeseburger with fries and soda. Then I upgraded it to Wild Fries for an additional P100. Yes, that is P425 for this meal for 1 person. But maybe the price gets justified, I thought to myself, if it tastes really good. So I took the first bite of the burger and I went “okay” in my head. Then another bite hoping it would taste better. But sadly, I was able to finish it without the “wow” factor I was hoping for. Beef patty is juicy but a bit bland. It lacks sauce but I like how everything in it looked fresh. The Wild Fries is good, on the other hand. It’s not on the displayed menu though, so you need to request for it. 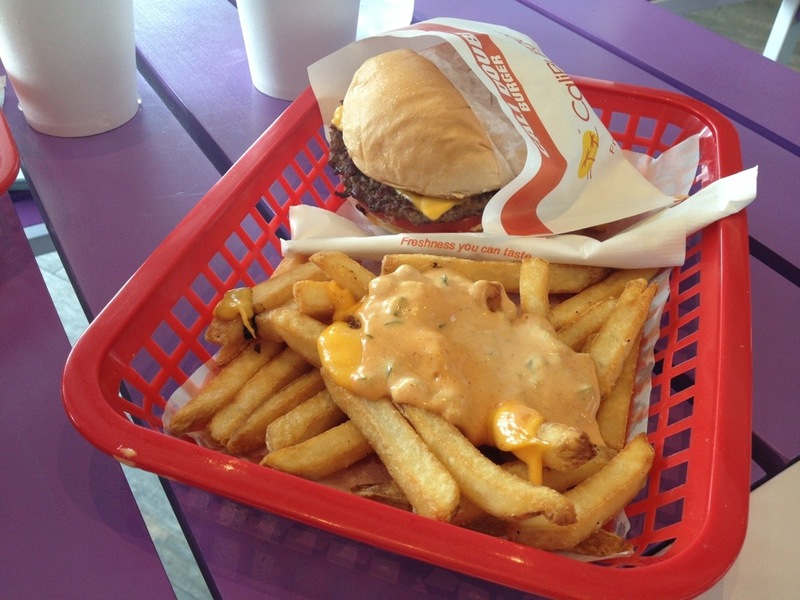 I also like how it is topped with cheese and their special Cali Sauce. The fries to cheese / sauce proportion is kinda off though. And I think it’s pricy that you need to add P100 for it. Actually, I think the whole meal is pricy (and I have broad uderstanding of pricy and acceptable when it comes to food). So, the verdict? Will I go back again? Yes, but only if it’s free haha Kidding aside, I am not closing my doors. I can consider trying it again maybe when they have new items on their menu and if they will lower their price a little That’s a burger meal for almost P500. And I think I can get the same or maybe a better burger in other joints for less than that price. I don’t know, let’s just say that I have a CaliBurger in my hand and I am thinking about Wendy’s Bacon Cheeseburger in pretzel bun. What’s wrong with me?? 1. Place chicken breasts in a container. 2. Squeeze in the lemon and orange then add mashed and minced garlic. 4. 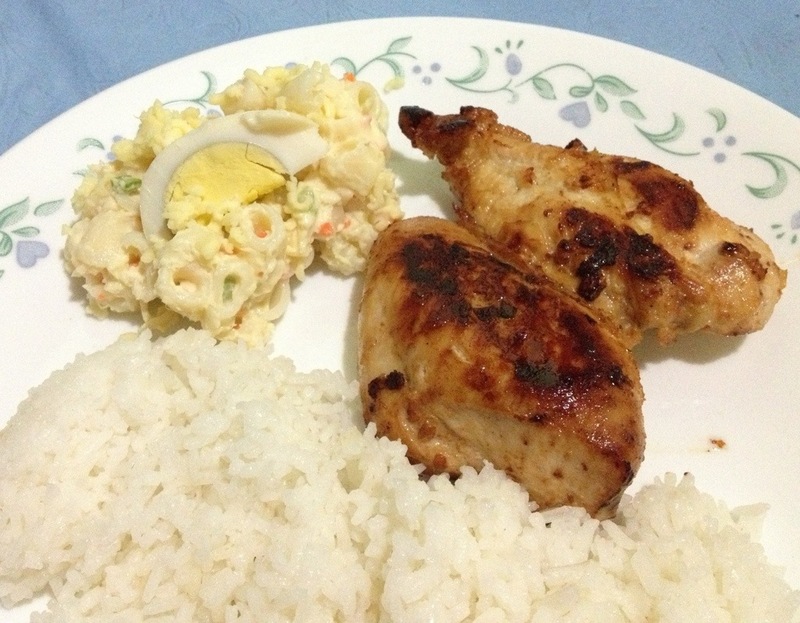 Marinate chicken for about 20 minutes. 5. Once done, heat some olive oil in a pan. 6. 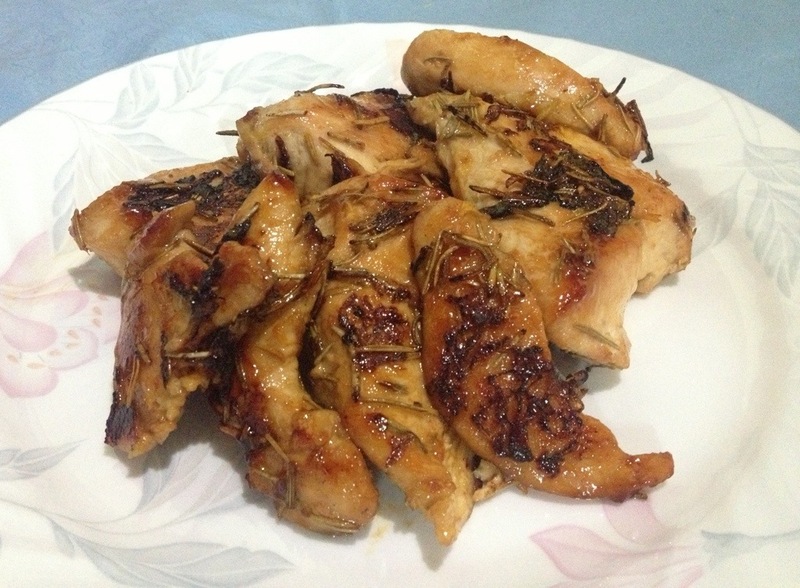 Fry chicken in low heat until golden brown. Voila! Six easy steps and you have your tasty chicken! 🙂 Serve with rice and macaroni salad for a plate lunch effect. Fun fact: A “plate lunch” is a Hawaiian meal which consists of white rice, macaroni salad and an entree.